A great experience to share, book an exclusive family lesson with our friendly coaches. 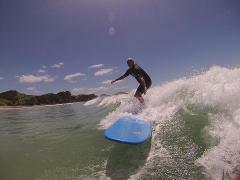 Private surf lesson for tailored, one-on-one, advanced surf coaching. If you want an exclusive lesson for you and a friend, pertner, family member etc, select 'for two' and have a coach to yourselves at a reduced rate of $95 each.